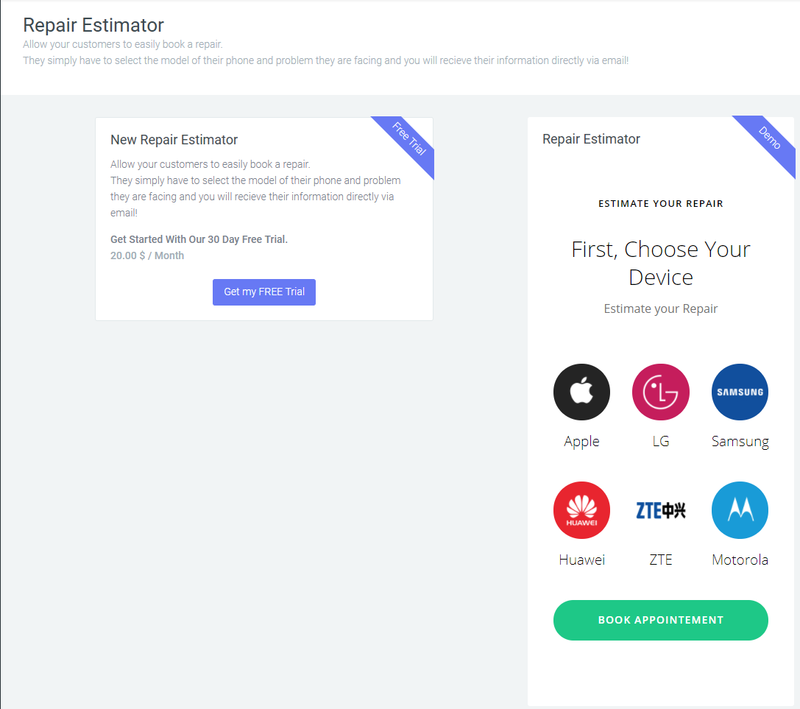 The Repair Estimator allows you to quote repairs and book appointments for your customers directly from your own website. You can specify the repair services that you are offering and set your prices. Save time and expand your reach with automated appointment booking. Streamline your business by having repairs booked in advance and making sure you have the parts required before the appointment with the customer. The installation and configuration is very simple to do and should take only a few minutes. Login to your unlockr account and navigate to the repair estimator. Click to Start your free trial if you haven’t already. You can already see a live preview of your estimator to test your settings. Click the Generate repair services button to start configuring the repair services that you provide. Note that you can generate any number of repair estimators that you want, a good use case would be if you want to have different pricing for different areas of your website. For this example we are selecting iPad. All the possible services for it will be automatically generated, from there you can change the services name and price to reflect what you want. You can also delete whatever service that you are not offering or don’t plan on using. Don’t forget to save your modifications. Once you have configured all the services that you want, simply click the install on your website button to get the line of code required to put in your website. You need to make sure you copy the complete line of code otherwise it will not function properly. Paste the line of code wherever you want to have the widget on your website. If you use wordpress, you can paste the line of code in a simple text block and you will be ready to go. Whenever someone books an appointment you will receive an email to be notified. If you are unsure how to install it on your site we strongly advise contacting us or your website administrator to have it installed, simply provide them with the line of code and the location where you want it installed and they should be able to do it for you without any specific instructions. If you need any assistance with this don’t hesitate to contact us it will be a pleasure to help !